CCHQ has just released the next list of selecting seats. The deadline for applications is 2pm on 15th January. The list of twelve includes the two plum seats of retiring MPs Angela Browning (Tiverton and Honiton) and Michael Mates (Hampshire East). "I am delighted to have been selected for Bolton West- given my experience of winning in a Metropolitan area, I see this as my next challenge and a challenge that I intend to win for the people of Bolton West. As a Greater Manchester constituency, Bolton West is local territory for me and I am very familiar with many of the issues that affect the people here. I am really looking forward to working for the people of Bolton West." Cllr Williams beat local man Stephen Ogden. On yesterday's Platform Robert McIlveen noted how tactical voting could help win seats like this. Local councillor Alec Shelbrooke and Yorkshire A-lister Julie Moody will take part in an open primary on Thursday 11th January 2007 to select the Tory candidate for Elmet and Rothwell. The seat has a projected Labour majority of 6,295. Malcolm Rifkind, current MP for Kensington & Chelsea, was tonight chosen to represent the new seat of Kensington, which has a projected majority of over 5000. Greg Hands is taking on the Chelsea part of his current constituency. TV doctor and A-lister David Bull has been selected as the Tory candidate for Brighton Pavillion (projected Labour majority of 6,523). The other finalists were Helen Whately, Jessica Lee and David Brogan. Bradford council leader Kris Hopkins has been adopted for the seat of Keighley and its projected majority of 4,852. Cllr Hopkins beat Karl Poulsen according to the Keighley News. Following Paul Offer's resignation as candidate for Chester the local newspaper, the Chester Chronicle, is linking Adam Rickitt (website here) to this highly marginal Conservative seat. 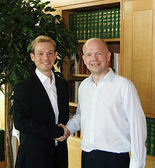 As a Cheshire local, friends of Adam Rickitt are reportedly saying that "he would love to have a stab at being selected by Chester Conservative Association." Mr Rickitt told the Chronicle: "I cannot comment on an association matter at this time, but I know the Conservative Party in Chester is making great leaps forward." The selection is unlikely to begin until after May's local elections. The Chronicle also mentions former Lord Mayor Mike Jones, County Cllr Eveleigh Moore-Dutton and City Cllr Caroline Mosley as possible candidates. Dr John Hayward is Political Deputy Chairman of Tonbridge & Malling Conservative Association and is on the Party's list of approved candidates. His 100 policy idea to channel more overseas aid through civil society organisations was recently approved. "This time last year, David Cameron was elected leader of our Party on a ticket of change. He constantly tells us that we need to modernise. Others add that when it comes to key marginals, we need to be far more professional. As a candidate who is not on the golden priority list, you might expect me to be numbered among those who say we've gone too far. You might be surprised, then, to learn that I believe we need to go "faster, wider and deeper." The problem, it seems to me, is not that the present reforms with regards to selection of candidates are unnecessary or unwelcome, but that they only come at the issue from one side. Yes, we clearly needed to do something both to increase the proportion of women on the Conservative benches in Parliament and to reverse the unwelcoming impression that has previously made us unattractive to many accomplished women. However, merely weighting the gender balance of available candidates is unduly harsh on candidates if there is not equal effort placed on making selection committees more professional - particularly given that the problem principally lies with the decisions taken by the committees, not with the candidates themselves. Even at last Saturday's Candidates Conference, there was talk of illegal questions still being asked at selection interviews and associations dysfunctional as a result of their own internal divisions and power struggles. I have recently had the chance to be involved in two selection processes: one, as an approved local candidate for Parliamentary selection; the other, as a parent governor on the new headteacher selection panel of my son's school. The difference between the two are as night and day, the latter being so much more rigorous and professional. A local meeting this evening chose the current Hammersmith & Fulham MP to take on Chelsea & Fulham, projected majority of over 10,000. There had been concern that Malcolm Rifkind, of Kensington & Chelsea, would compete for it but it looks almost certain that the new seat of Kensington, projected majority of over 5000, will adopt him later this week. "The issue here from the point of view of an activist is that with the system used to select the Parliamentary candidate is questionable. As chairman of Newcastle I voted for selecting our leader by one member one vote. Would David Cameron have been able to carry out his positive reforms within the Party if he had been selected by sixteen in an executive? My guess is no. I would suggest that any Association reading the comments made on this site, and who are considering using a system where the members do not feel they have a say who the final choice is, should please re-consider. I would also suggest, with the greatest of respect, that the Party nationally seriously reconsider a system that effectively could lead to the members fifth choice being selected as the next member of parliament for a seat." Cllr Morton is the innocent victim of all this. Few have question marks about her abilities but there are real question marks about whether she enjoys the confidence of local members. She needs to resolve that issue and fast. ConservativeHome encourages her to call a vote of confidence of all members in her selection. In due course she will have to be formally adopted but a quick vote is the one sure way of establishing that she has the confidence of all members and will limit the possibility of the Association limping along, wounded and divided. Her very decision to act boldly in this way will also increase her chances of winning support within the Association. CCHQ must also act by abandoning this selection ordering. Candidates should be chosen by the whole Association - not just a grouping within it. News has reached ConservativeHome of a major setback for Labour in Lancashire where last Thursday the ruling Lab/Lib Dem coalition on South Ribble Council were forced into a u-turn over their attempts to abolish the council by merging it with the City of Preston. The Government has been urging councils to seek a merger with other neighbouring councils in a number of areas as part of its City Regions Agenda. This is clearly part of the Government's ongoing Regionalisation agenda and as such is opposed by the Conservative Party. Until last week it seemed that this would be a rubber-stamping exercise in areas such as South Ribble. Certainly the local Labour and Lib Dem politicians in South Ribble seemed to think so as they voted to spend £60,000 on consultants to prove the case for a merger just two months ago. However, Lorraine Fullbrook the Conservative candidate in South Ribble who has already defeated the Lancashire Police Merger this year had other plans. Proving once again the power of selecting candidates early (she was reselected in October last year having fought South Ribble in 2005), Lorraine launched a text book campaign that has resulted in the Labour Leader of South Ribble rejecting his own recommendations and instead accepting the Conservative’s favoured option that retains both the County and the Borough Councils with some minor changes (the so called improved two tier option). Lorraine won by putting out three newspapers over six months that made local people aware of the merger proposal and by setting the agenda from day one. She forced the Council to hold public meetings and even delivered her own vote on the proposal to 35,000 homes after the Council refused to do so. Anyone else facing a forced Merger might like to drop Lorraine a line at [email protected] I understand that she is more than willing to share tips on what her campaign did. A-lister Jesse Norman is Senior Fellow at Policy Exchange. A former Director at Barclays Bank, he has also taught at University College London, where he has an honorary research fellowship. He is married with three children. He has written or edited six books, including most recently Compassionate Conservatism: What It Is, Why We Need It, published in June 2006. His journalism has appeared in The Times, Sunday Times, Guardian, Financial Times and Spectator, and he is a regular TV and radio performer. He presents The Ideas Show on 18 Doughty Street Talk TV. Following the decision of Hereford's sitting MP to step down, the seat must be one of the Tories' best hopes of a pick up from the LibDems. PPC for the seat in 2001 and 2005 - Virginia Taylor - deserves enormous credit for moving the seat into such marginal territory. UK Polling Report projects the LibDem majority as 1,297. Labour ward was apparently crucial to his selection victory. UK Polling Report's projection is here, Download a copy of Chris' leaflet here and visit his website here. Paul Maynard, A-lister and special adviser to Liam Fox, was selected last night for Blackpool North. Best of luck to Paul in overturning a projected Labour majority of 3,540. Appearing to confirm a whisper that had reached ConservativeHome the Daily Mail is reporting that A-listers who have applied for an inadequate number of seats or are refusing to apply for seats outside of London and the South-East. Will Wiltshire North Tories keep James Gray? We and Mr Gray will know the answer to that question on 30th January when the ballot papers sent out to local members on 12th January will have been gathered in and counted. The picture above was taken at the first anniversary celebration of Women2Win. Pictured from left to right are Tory candidates Jane Ellison, Deborah Dunleavy, Pauline Latham, Priti Patel, David Cameron, Andrea Leadsom, Joanne Cash, Louise Bagshawe, Harriett Baldwin and Lorraine Fulbrook. The latest update of ConservativeHome's rolling record of selected candidates gives W2W more to celebrate. The proportion of women selected overall (since CH's previous update) has risen from 35.1% to 38.1%. Of the last 22 selections 45.6% have been women. 39.0% of all selections since the introduction of the A-list have been women and women appear to be faring particularly well in the more marginal seats. Male A-listers are doing surprisingly badly because the proportion of non-A-listers winning selection is also up. 46.8% of all selected candidates are not on the A-list (although some may not have been correctly identified as A-list members because of continuing CCHQ secrecy). Leader of Barnet Council Mike Freer has been selected for the Tories' number one target seat of Finchley and Golders Green. Cllr Freer fought Harrow West at the last General Election. Best of luck, Mike, in unseating Rudi Vis. Co-Chair of the Candidates Association Mary MacLeod (CV here) has been selected for Brentford and Isleworth (projected Labour majority of 3,471). ConservativeHome's warm congratulations to Mary. Mary is the fifth woman to be selected in a row. Two hundred or so A-list and other approved candidates attended. Grant Shapps MP gave an excellent presentation on e-campaigning and on the benefits of contacting 7,000 voters a week and to do so with next to no funds! Rishi Saha of CCHQ gave a highly practical presentation on how to get a social action project off the ground and demonstrate 'compassionate credentials'. Tony Juniper of Friends of the Earth admitted that nuclear power was an option even if it wasn't FotE's favoured option. John Maples’ suggestion that CVs might need a bit of polishing if candidates weren't getting interviews went down like a lead baloon with the 75% of non-A-listers in the room who hadn’t even had the chance to submit a CV. John Maples and Shireen Ritchie appeared ignorant of “local” candidates being vetoed by Candidates’ Team/CCHQ after being invited to apply by local Chairmen. Mary Macleod struggled to put a positive gloss on finding it impossible to get a shadow cabinet minister to go north of Watford – no, sorry, north of Westminster – to do a policy briefing for candidates in the north. One of the questions for John Maples was - "Why do we (non-A list candidates) have to find out about upcoming seats from Conservative Home and not from you?" This reportedly generated a good deal of applause and provoked Mr Maples to say he would "consider it". Shireen Ritchie's said that she had initially seen ConservativeHome as a threat and an irritation but now was able to "live with it". Maples also said he had to "sometimes" read this to find out what was going on. There was also a lot of gratitude to David Senior and Mary Macleod of the Candidates' Association for organising the event. Local A-lister Anne-Marie Trevelyan will have a tough job overhauling B-u-T's projected LibDem majority of 8,571 but I hear tremendously positive things about Anne-Marie and wish her every success. Fleur Butler got through to the final stage and my reputable source tells me that she impressed but not enough to beat the local winner. A-lister Amber Rudd (who recently authored this for ConservativeHome) has been selected for H&R today and has to overturn a projected Labour majority of 1,205. Good luck, Amber! ConservativeHome is hearing that it couldn't have been closer. Amber won the selection after winning a tiebreaker against Sam Gyimah, CBI Entrepreneur of the Future in 2005. Sam is one of the party's most promising candidates and i hope he'll win a selection somewhere very soon. The Conservatives' number one target seat selects tomorrow - Finchley and Golders Green. With boundary changes the Tories only have to overturn a majority of 31. Regular readers of ConservativeHome will know that I desperately hope that Vanessa Gearson is not selected. I am a first hand witness of her dishonesty and incompetence. It is extraordinary that she is still on the candidates' list after her performance in Cheltenham at the last General Election. I hope that a seat associated with the greatness of Margaret Thatcher has the sense to choose Suella Fernandez, Mike Freer or Samantha George. A-lister and Richmondshire councillor Wendy Morton has just been selected for Tynemouth. She won her place in the final after Julie Moody and Anne Marie Trevelyan had dropped out. Wendy fought Newcastle upon Tyne Central at the last General Election. Wendy Morton won one of the Dragon's Den votes at the Party Conference for her idea to ensure that new homes are more energy efficient. She has to overturn Alan Campbell's projected Labour majority of 5,532. "Recently several candidates have pulled out of selections very late in the process and at very short notice. This causes us and the constituencies concerned great difficulty and often deprives another candidate of the chance to be considered. I realise that with so many constituencies selecting many of you will make multiple applications and then pursue those who offer you interviews. This is perfectly acceptable, but I must insist that candidates do not pull out after they have been put through to the final round. This means that you should pull out immediately after the first interview, or if this stage is omitted, immediately after you have been notified that you are through to the Executive or Big Event. Do not go past this stage unless you are willing to participate enthusiastically to the end and are prepared to be the candidate. If a clash of dates arises, we will try to help associations to re-arrange these to accommodate you. If you do have to cancel at the last moment, you must inform association concerned as soon as you can and give them a very good reason. We want you all to get selected and compliance with this request will make it much easier for us to manage the selection process." Two locals Barry Howard and Michael Ellis compete with Rutland A-lister Christine Emmett for the seat of Northampton North (projected Labour majority 3,483) in an open primary selection this evening. Yet another example of an Association choosing the open primary route to avoid the half-women-final rule. Gedling selected Bruce Laughton last night. He is a Newark and Sherwood District and Notts County Councillor who fought next door Sherwood in 2005. Minor boundary changes will produce a projected Labour majority of 4,876 for Cllr Laughton to overturn. The unsuccessful candidates were Kedra Goodall, Jessica Lee and local candidate Professor James Thornton.